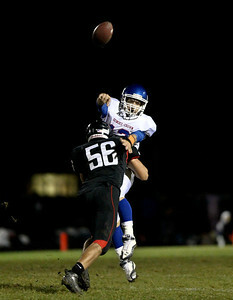 Josh Peckler - Jpeckler@shawmedia.com Dundee Crown quarterback Garrett Ryan manages to get a pass off while being tackled by Huntley's Brandon Dranka during the second quarter at Huntley High School Friday, September 21, 2012. 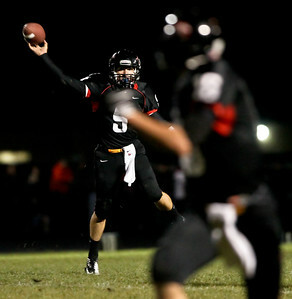 Josh Peckler - Jpeckler@shawmedia.com Huntley quarterback Kameron Sallee throws a pass to a receiver during the second quarter against Dundee Crown at Huntley High School Friday, September 21, 2012. 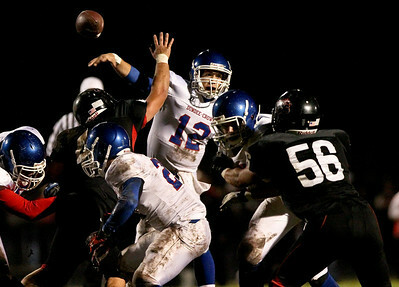 Josh Peckler - Jpeckler@shawmedia.com Huntley quarterback Kameron Sallee (center) tries to avoid being tackled by Dundee Crown defenders during the first quarter at Huntley High School Friday, September 21, 2012. 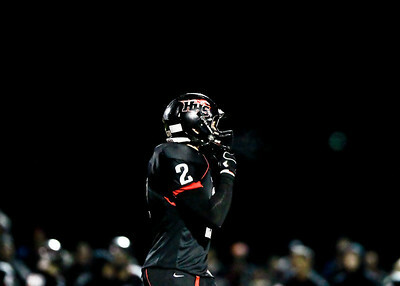 Josh Peckler - Jpeckler@shawmedia.com Huntley's Jordan Kabb lines up for the opening kickoff against Dundee Crown at Huntley High School Friday, September 21, 2012. 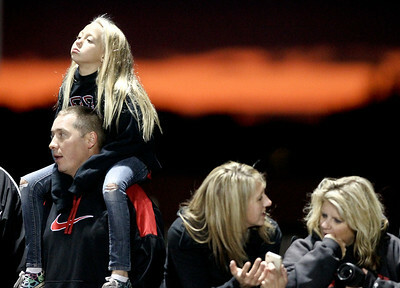 Josh Peckler - Jpeckler@shawmedia.com Riley O'Mare, 8 of Huntley sits on the shoulders of her dad Brian as they watch Huntley and Dundee Crown play at Huntley High School Friday, September 21, 2012. Josh Peckler - Jpeckler@shawmedia.com Dundee Crown quarterback Garrett Ryan throws a pass during the second quarter at Huntley High School Friday, September 21, 2012. Josh Peckler - Jpeckler@shawmedia.com Dundee Crown's JT Beasley (10) runs the ball with Cody Lane (21) lead blocks during the second quarter at Huntley High School Friday, September 21, 2012. 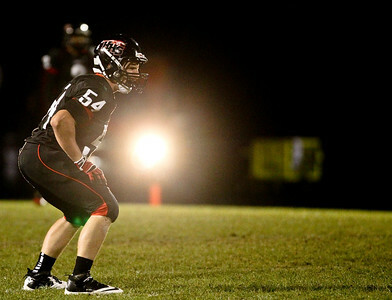 Josh Peckler - Jpeckler@shawmedia.com Huntley's Mike Andrews has steam come out of his face mask as temperatures dropped to the low 50s during the first quarter against Dundee Crown at Huntley High School Friday, September 21, 2012. 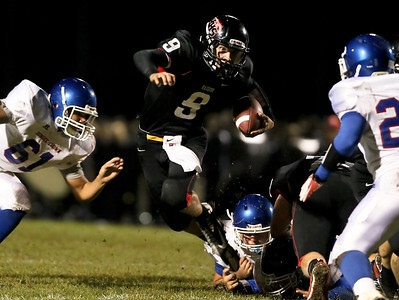 Josh Peckler - Jpeckler@shawmedia.com Huntley's Ethan Connor runs with the ball while being chased by Dundee Crown's Ray Griggle (70) during the first quarter at Huntley High School Friday, September 21, 2012. 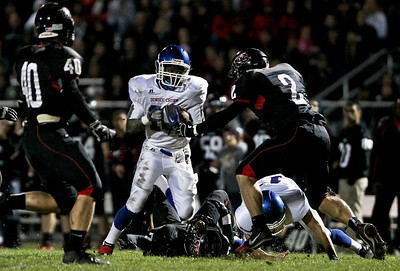 Josh Peckler - Jpeckler@shawmedia.com Dundee Crown running back JT Beasley (10) runs with the ball trying to avoid being tackled by Huntley's Mike Andrews (2) during the second quarter at Huntley High School Friday, September 21, 2012. 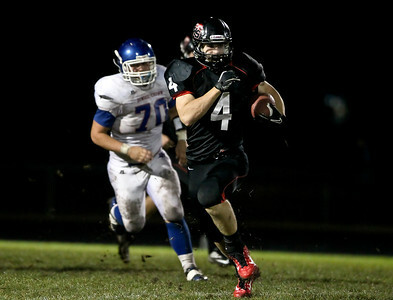 Huntley's Ethan Connor runs with the ball while being chased by Dundee Crown's Ray Griggle (70) during the first quarter at Huntley High School Friday, September 21, 2012.